(From left) Red Wings Darren Helm, Luke Glendening and Dennis Cholowski during the second period of the Wings' 3-2 overtime loss to the blue Jackets on Thursday, Oct. 4, 2018, at Little Caesars Arena. The evening began on a high note as Henrik Zetterberg made his return to Little Caesars Arena. It was only to drop a ceremonial puck, but it gave fans a chance to cheer Zetterberg for the first time since he announced his retirement in September. The season opener against the Columbus Blue Jackets, however, began on a low note as the Detroit Red Wings struggled through the first period Thursday. 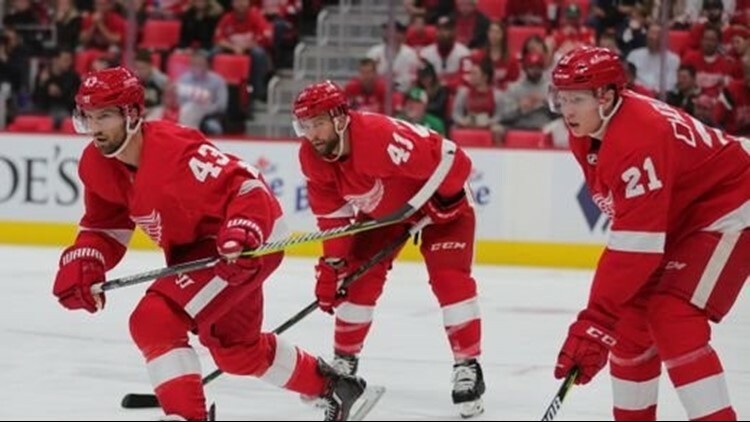 A couple young guys — Dennis Cholowski and Tyler Bertuzzi — scored in the second period, but the Wings stifled their own chances as they amassed six penalties in regulation. The Wings directed just three shots on net in the third period and were outshot, 38-17, overall headed into overtime. The Wings wound up losing, 3-2 when Artemi Panarin scored in overtime. It was a memorable night for Cholowski, a 20-year-old defenseman who scored in his NHL debut and with his parents in the stands. It was Cholowski who pumped energy into the building when he scored at 7:46 of the second period. Cholowski was skating through the low slot and Dylan Larkin sent the puck out front, and Cholowski tapped it into Columbus’ net. The Blue Jackets restored their lead at 13:06 when Josh Anderson pounced on a loose puck in the paint. Bertuzzi worked his way into the top six mix and power play time during the second half of last season, and stood out again in the opener. A bullish shift that saw him maintain possession as he was hounded in the offensive zone led to a nice scoring opportunity when he sent the puck to Flip Hronek by the left side of the net, but Hronek shot wide. Later in the second period, Bertuzzi was rewarded for going to the net on a power play, as he deflected Larkin’s pass for a 2-2 game at 16:13. Gustav Nyquist also had two assists. There wasn’t much to like about the Wings in the first period. Their first couple shifts were fine, but then Bertuzzi took a delay of game penalty at 4:19, and Cam Atkinson converted when he fired a puck between the legs of both Joe Hicketts and Jimmy Howard at 5:12. From there, it took the Wings five minutes before they directed another puck at Joonas Korpisalo, and when they did, it wasn’t much of a scoring chance. Cholowski was called for holding at 12:52 but that penalty kill only lasted 17 seconds, as Panarin took a penalty to make it 4-on-4 for 1:43. The Wings went back on a penalty kill at 17:38 when Justin Abdelkader was called for slashing. Darren Helm, Luke Glendening, Danny DeKeyser and Trevor Daley killed almost the entire two minutes. One positive was Jimmy Howard, who made 10 saves to keep his teammates in the game.